“There is no other Troy/For me to burn”, sang a young, angry Sinéad O’Connor back in the day. If she’d been watching the born-again fervour at the RDS last night, where Fianna Fáil were attempting to once again smear a little lipstick on the pig of their failed politics, she would have found one. Robert Troy blew hard in the trumpet, and then he was there – the man who apparently only arrived in Ireland a year ago, and had nothing to do with its ruination – Micheál Martin. No doubt Martin believes he spoke bravely as he forked his tongue around an apology that was – in contrast to RTE’s reporting – anything other than unequivocal. It’s not enough to point to the worst world recession in 80 years and the Eurozone crisis. Nor to point to the fact that other parties were demanding policies which would have made things worse. It’s worth pointing out that Ireland’s troubles are not a result of the Eurozone crisis- we are in fact the cause of a great deal of it. And for that, the blame lies one thousand percent with Martin and the rest of his Fianna Fáil spivs, who were – lest we forget – in power at the time. He continues to perpetuate one of Bertie’s many, many lies. Nothing has changed. But for all his bluster, his attempt to regain the high ground of Republicanism from Sinn Féin was probably the most laughable – here was the party that sold this country down the river, throwing away our hard-won sovreignty, claiming to be Republicans? If Tony McCoy’s undercarriage is ever damaged beyond repair, he can transplant Martin’s neck as fine replacement. But if the laughter in a million living rooms wasn’t enough, the optics were the most damning. Every time Martin spoke of pride and achievement and of a new kind of politics, the camera panned to the Soldiers of Destiny who were the architects of our national downfall – Cowen, Coughlan, Lenihan and the spineless goons that kept them in power, not to mention Martin himself. Not only that- the party faithful actually applauded them. It would appear the party faithful are also at least partly mad. As the recent interview with the despicable Mary Hanafin has proved, nothing in Fianna Fail has changed – not their policies, not their leadership, not their sense that they did nothing wrong. This crisis is something that just happened to them. They consider themselves to be desperately unlucky, rather than grossly inept and fantastically corrupt. What they should have done was to go around to the other side of the RDS, where a careers fair was taking place. There, they would have met the thousands desperate for a better future – any future – now forced to leave the country because of the catastrophic greed and failure of Fianna Fáil. There, they could have prostrated themselves before those who are the true victims of this crisis- not themselves, as they would have you believe. And there, they could have given the greatest apology of all, which would be to close down their corrupt, cancerous party and start anew. That would have been an apology worth making. You are not responsible for the crisis. That didn’t last long, did it? Yesterday Enda did another of his patented u-turns (don’t worry, they’re all part of his five-point plan) and blamed the Irish people for going “mad” on cheap credit. How can he possibly blame us, the plain people of Ireland? Surely the fault lies with the bankers, right? Nothing will be learned from this financial crisis unless we learn why it happened, who was to blame, and how to stop it happening in the future. The bankers and reckless lenders are obvious targets, but we had failed long before we ever got on the playing field. The responsibility for the crisis lies almost exclusively with those tasked with regulating and monitoring the affairs of the state- the politicians. Let us remember that it wasn’t just Fianna Fáil that were responsible either- the free-market zealots of the Progressive Democrats, Fine Gael and the Labour Party (don’t be fooled by the name) were equally to blame. Even when in opposition, they nodded like donkeys as Aherne, McCreevy and Cowen stripped away the protection the plain people of Ireland were entitled to. So Enda is hardly going to sit up there in the middle of his Davos dancing monkey act and admit that he was partially to blame now, is he? It is absolutely true that people borrowed wildly and that banks lent recklessly, and some would say who could blame them. Both were trying to live the dream of a lifestyle and profits beyond their wildest dreams. But how could they do this? Because, ever since the first sod was turned at the IFSC, every single piece of legislation or regulation preventing them from taking excessive risks with borrowed money was removed by the politicians. It may have changed in the last three years or so as normal people were forced to learn about bond yields and sovreign debt, but the plain truth is that most people are not financially literate enough to understand even basic financial products like mortgages and life insurance. I’ve spent the guts of ten years in the financial services industry, talking to ministers and central bankers and traders and fund managers. I’ve studied finacial instruments trading at university level. All it has taught me is that the more I learn, the more there is to learn. Those operating in the markets- even in the personal finance end of them- are for the most part unsentimental, mathematical and very ambitious. They will stretch the limit of any rule in search of a profit- that is their creative genius. But in removing the rules of the game, we allowed them to indulge themselves and us, and we all got hit with the bill. We even tore up most of our planning laws just so we could allow developers to stack their piles of yen and German pensions on one another in a race to the top, not realising it would all fall down around us. Sure, lenders and borrowers are to blame, but only to a point; if you give the fox the keys of the henhouse, don’t be surprised if all that’s left are feathers and blood. What galls most people is that no banker or politician has yet to face the courts in relation to the €100 billion confidence trick played on Irish people. The sad reason for this is that very little of what was done was illegal- we simply removed those barriers and let them get on with it. And so to the hide-and-seek champion of Mayo, who did his monkey dance for the great and the good at Davos yesterday, a day after many of them took their chunk of the €1.25 billion Enda so selflessly gave them on our behalf. And today, ministers gather round to defend him- even Labour ministers – saying that he was either partially or wholly right. His minions duly obliged, Fionán Sheehan of the Indo playing the role of government representative on Vincent Browne last night, and the Lunchtime program on Newstalk offering an embarrassing plethora of talking heads echoing the Taoiseach’s comments. 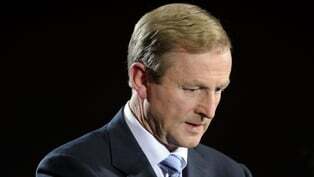 The level of stage management of the cabinet response warrants closer questioning- in other words, there is reason to believe that Enda’s comments were no regular political gaffe. There is reason to believe that what you saw and heard yesterday is the first step in selling the next- and probably the most onerous- austerity budget to the Irish people. In December, Enda went of the TV to pre-empt a public outcry and in a stilted performance, his hear slicked to his head, he told us we were not responsible. Gullible fools that we were, we bought into the savage cuts – sure weren’t we all in it together? That won’t work again, and the next targets – the old, the sick, and the young once more, but also the public servants and PAYE workers – won’t be as amenable, so a change of tactics was called for. So Enda and his cabinet have decided that we are in fact to blame – and in doing so, they are preparing us to take our personal share of the pain that is coming. After all, it’s our fault that we’re in this mess. What Enda should have said yesterday was “yes, the banks and the borrowers were to blame, but we- the democratically elected politicians, dropped the ball. Lads, the party is over. Europe’s biggest casino will be back, but there will be limits on how much you can gamble with our money in the future”. Instead, he blamed you and me. At the same time, the treacherous Fianna Fáil spiv that is Conor Lenihan appeared on the radio, blissfully unaware of the scale of his own hypocrisy. Part of a dynasty that did its best to destroy our economy, he is now travelling the world touting for foreing direct investment. Now some people might say that ‘traitor’ is too strong a word in those circumstances. I’m glad I’m not one of them. In the end, there was no empty chair. Plenty of empty rhetoric and a bunch of hollow threats and empty promises, but no empty chair. So who were the real winners last night? At a stretch, bearded Bobby in Leitrim made the best case- if he had been slightly more eloquent and cut short his rant a little, the man who called Kenny out before being thrown out himself would have been the major winner in last night’s debates. As it was, they threw up nothing, apart from another chance for the parties to repeat their messages again. There is a truism in communication that the listener cannot be told what to think, but they can be told what to think about. People are most influenced by others around them – family members, friends, co-workers, team-mates etc., and it is by discussing the issues of the day with them that we come to our own conclusions. By focussing on what you are good at – or indeed what the other crowd are bad at – you control what people talk about in the pubs and factories around the country, and that is what ultimately gives you a chance to change their minds. No election poster or canvasser in the world ever convinced someone to change their vote; we don’t trust them the way we trust our friends and family, and rightly so. They are in it for them, not us. Seen in the context of this election, Mícheál Martin is hoping to look forward and to conveniently ignore the fact that the banks stole the country on his watch. There will be no more “sorry”, no more excuses, for a good reason – there is simply no chance that they can convince us that what anything they did in government was of any benefit whatsoever. Their legacy is tarnished beyond repair. Instead, he and the rest of Fianna Fail would have us suspend our better judgement, ignore the past and give them another crack of the whip, as if everything that happened was beyond their control. Frighteningly, about 16% of voters have already bought this line of reasoning. For Labour, the balancing act is more difficult. Irish people have a pathological aversion to paying tax, and any mention of raising them will cause voters to run a mile. But without taxes there can be no stimulus, and besides, the burden of the ECB/IMF debt cannot be serviced without money coming in to the state’s coffers. It is easier for Labour to concentrate on attacking the opposition than pushing their own agenda. Meanwhile, Enda Kenny and Fine Gael are in pole position and the election is theirs to throw away- and with the defensive tactics they are employing, they could yet do so. Kenny’s charisma deficit is a major flaw, but not fatal; what could prove fatal is his mealy-mouthed excuses for not engaging with the other leaders, and his clumsy efforts to avoid the arena in which he is least comfortable. If he were straight with the electorate, they’d probably forgive him. No-one likes a chicken, but for once the public is well-prepared to accept a leader who doesn’t pretend to have all the answers- having been fooled into believing that Bertie Ahern, Charlie McCreevy and Brian Cowen had somehow become economic geniuses because they could engineer a property boom, it’ll be a long time before they trust anyone again. Kenny would do well to study the steady hand at the tiller that is displayed by Swedish prime minister Fredrik Reinfeld – since taking over the Moderate party, Reinfeldt has reinvented himself as a statesman, carefully delegating responsibility but always seeming in control. He, like Kenny, is charismatic in person but it doesn’t transfer well to the medium of TV, and the first step to solving this problem is to acknowledge it and not try to force it – we’re trying to elect a leader here, not a host for the Late Late Show. Instead, Kenny has in turn tried to run away from it, and then tightly control it by broadcasting his own public meeting on the internet. In doing so, he has made himself a laughing stock. SInn Féin have been a bit schizophrenic, mixing some excellent contributions with some seriously shoddy ones, especially on economic issues. The opposition has managed to create the impression that they can’t do detail, and that is likely to stick unless they either buck up on the homework or shift the focus entirely. The outcome of this election depends on who manages to dictate not what we think, but what we think about. The revelations this morning that Anglo may need another €15 billion would, in any other country, have buried Fianna Fail forever. The no-show by Enda Kenny and his subsequent kicking by bearded Bobby would have put paid to Enda’s chance of being Taoiseach, had there been a credible alternative. Eamon Gilmore had the chance to show that he was that alternative on the TV3 debate, but didn’t – or couldn’t – take it. And that is essentially what we should be thinking about – the lack of a credible alternative to the politicians that have repeatedly failed us. There are still no big ideas, there is still a yawning chasm in the credibility of all the leading politicians, who in effect allowed this to happen. But it works both ways – we can’t tell our leaders what to think, but on the doorsteps and in the media we should be telling them what to think about, such as burying the bad banks and providing a future for the country that is not overshadowed by debt and death on hospital trolleys. By communicating our own agenda loud and clear, we can at least get them to talk about it among themselves, and maybe even change their minds as we go along.